In a move totally inspired by Ashely & Jimmy from Feast of Fiction - I went full nerd and cooked up a dinner for Kale with a menu straight from our current favorite video game obsession - Don't Starve Together. 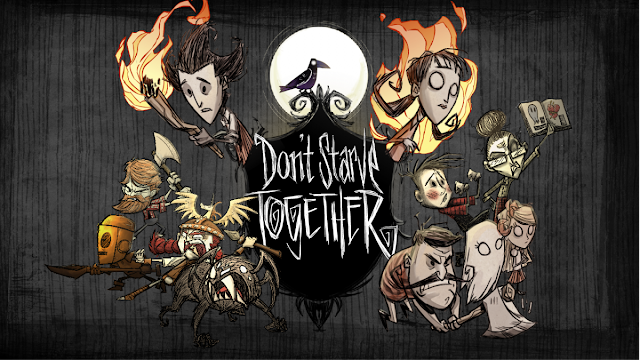 OK OK - I know you're first asking... what the heck is Don't Starve Together? It's a multiplayer "wilderness survival game" that involves collecting resources, battling creatures, and basically just trying to strategize and figure out how to not die. Constantly. Because everything is trying to kill you. The animation and styling are STUNNING and for that alone I'd say check it out. This game totally fits a lot of buckets for the two of us. First, I want to believe that it somehow fills Kale's crazy survival instincts as he's one of those "Zombie Apocalypse prepared" kinda guys. He's even stocked up my house with a "Don't Die!" kit because he's very worried about me. I'm not a survivalist. I like the comforts of modern life and honestly if the world's coming to an end, I'd be more likely to be on a rooftop partying vs. in a bunker waiting for the aftermath. But Kale's determined to change me - and this maybe feels like a good first baby step? But onto the recipes!!!! So there are some smaller silly ones like "roasted carrots," "juicy berries," and "seeds" that we ate because those are integral to survival... but I cooked up 2 of the "crock pot" dishes - Meatballs and Monster Lasagna. Into a large pot or crockpot add the chili, jam, and seasonings and bring to a simmer. Mix until incorporated. The jelly will start to liquify and turn into a sauce with the chili! Add your meatballs and let simmer over a medium heat for 25 to 30 minutes. Remove from heat and serve warm with a spoonful of sauce and fresh basil for garnish! When cooking up monster meat, it gives your classic lasagna some purple layers! In a large pan cook ground beef, onions, and garlic until browned over medium-high heat. Add the rest of the sauce ingredients, reduce the heat to medium and continue to cook for about 1 hour, or until the sauce has thickened slightly. In a mixing bowl combine ricotta, chives, eggs, and salt. Set aside. To assemble, spread a spoonful of the meat sauce in the bottom of a 9x13" baking dish. Assemble 3 noodles in the bottom of the pan. Start layering first with the ricotta mixture, then the meat sauce, then a handful of cheese, and finally with a layer of eggplant. Keep going with another noodle layer and continue going until done. Top with remaining cheese. Cover pan with foil and then bake for 25 minutes. Remove from oven and remove the foil. Then continue baking for an additional 25 minutes, or until the cheese is browned and bubbly!